Cosmic Reality is a paperback, 350 page, two book presentation. You can order this book at the Shungite Store. Book One, The John Kennedy - Jesus Christ Connection, has been available as a free PDF file since 2003. You can still get a free copy at the following: PDF FILE Book One that will take you to the Wolf Spirit PDF collections. 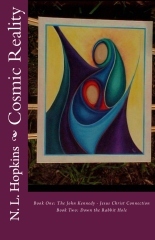 Look for "COSMIC REALITY", click on it and download the PDF. Amazon and Amazon Europe also carry Cosmic Reality. You can also join the Cosmic Reality Group on Face Book. Cosmic Reality provides a pathway out of the matrix of lies and deceit we have been subject to. In the end I concluded it was only by understanding that the Local Creator God, which I call Gaia, must become the focus of our efforts to create a new reality. And with that understanding, I was guided to a magical mineral called Shungite. You can read more in the blog Gaia's Gifts. You can get your own piece of magic by going to the store on this website Shungite Store.